Long before his School Dinners program for the purpose of serving more healthful foods throughout the British School System, was the 2002 documentary aptly title, Jamie's Kitchen . And agreeably, some of the students he pledged to help in this effort, appeared to have the most questionable work habits, leading many to see exactly *why* they were jobless -- in the first place. 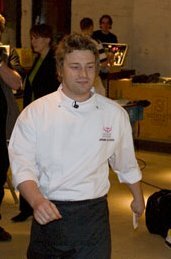 Still, Jamie Oliver, one of the UK's youngest and brightest master chefs was nonetheless dedicated in giving these 15 young Londoners a chance, as well as an "opportunity of a lifetime" at a full-fledged culinary career. Ultimately, it all became a part of his Fifteen Restaurant charity program, in collaboration with the original London restaurant, of the very same name. This week, TLC: The Learning Channel is airing this series again, and for me, it still remains a must-see, especially for those who never had the privilege of seeing it the first time. Clearly, there's a lot of true-to-life food service TV reality... going on here. Among the links and loads of information on the subject here, are those featuring an agritourism listing of farms around the world that welcomes tourists to harvest their own fruits and vegetables. According to these, September and October are the big months for apples and pumpkins-- but you'll also find plenty of fall raspberries and winter squash around this time too. So if you've got an extra minute spare and want to take advantage of this fantabulous time of the year while you still can, take a look, and enjoy. One was posed recently here at New York Magazine in one of their weekly Grub Street articles. And needless to say, it certainly got me thinking (as well as a few other people, I'm sure) and taking full note. 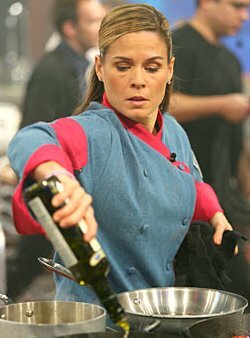 Basically, it involved the now familiar "food battles" featured on Food Network's Iron Chef America and a few other TV programs following the same exact format, where the emphasis is on showcasing several *masterfully* done dishes by expert chefs -- in little or no time at all. If that much good food can be invented and cooked in an hour, why do restaurants that have six months to prepare a menu so seldom come up with more than two or three interesting dishes? She was one of the favorites among the contestants on Season 1 of Bravo's Top Chef, and now, Lee Anne Wong of NYC returns in this neat little video clip to show you her talents. Dubbed very cleverly The Wong Way To Cook, it has only the best of connotations for Lee Anne, an accomplished chef and graduate of the French Culinary Institute here in NYC. And in it, she shows you step-by-step how to fully master one of the "Mystery Box" challenges that has already taken place in the first episode of Season 2, using a minimal amount of ingredients (one of the main purposes of this particular Top Chef challenge). It's back for a second season, hopefully with all the hyped up "back-stabbing" spice that made this show a true keeper in my opinion after last season's successful run. No doubt, even with all its usual "reality TV" spin, a judges panel including executive chef and restauranteur Tom Colicchio still succeed in keeping the show's high drama down to a saner, far less manic medium than its sometimes scream-fest counterpart, the Fox Network's Hell's Kitchen. Clearly, with Top Chef, the emphasis of the show(at least, it appears to be)is on each chef's ability to perform on his or her best level under pressure, as demonstrated in the random "Quick Fire" challenges -- as opposed to how wide the judges can bug out their eyes for the cameras, or come up with new and inventive ways to foam at the mouth as they smear unfavorable food bits directly down the chef coats of the contestants while publicly berating them. 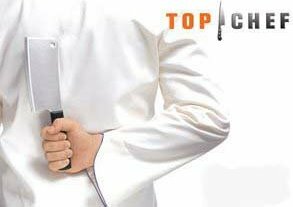 Not at all to say, however, that harsh criticisms don't happen on Top Chef, nor cat claws bared, or that feverish tempers don't fly. Trust me... they do. Big time. But special kudos to the Bravo Network for bringing this program back for another season, to showcase what behind-the-scenes in a restaurant kitchen would *generally* look like. While official NASCAR chef and Food Network host Mario Batali's face is a familiar one to many, if you've ever wondered what the faces of the Blue Man Group actually look like -- without the blue, of course -- well, okay, here's your opportunity. Following the remarkable impact of "Making a Name for Yourself," OPEN from American Express is pleased to present their second forum, "Standing Out in the Crowd," at the Nokia Theater here in NYC, dedicated to the art of marketing and how it can transform your business. Moderator Jean Chatzky hosts business innovators Liz Lange, Mario Batali, and the founders of Blue Man Group as they share the stories, lessons, and insights behind their incredible successes. Also, will be the rare opportunity to interact with these panelists, and exchange ideas and inspiration with other business owners. Read more here for ticket information for this event on the subject of small business ownership. Super chef and all around "terrific guy" (yes, I've met the man, and can personally attest to this!) 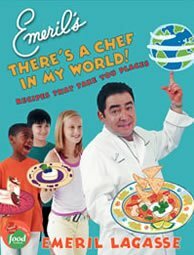 Emeril Lagasse recently noted that 25 years ago, American chefs were not respected in the world because the U.S. had no cuisine to call its own. "But now," he further states, "It's like we're... on fire"! And that's why he is also the author of kids' cookbooks, especially his latest, titled There's A Chef In My World , encouraging the young ones among us to rise to the occasion -- as well as summon their own food creativity. A cookbook for kids of all ages and adults to use together, this one offers 75 recipes for daily meals, special occasions, and everything in between, along with cooking tips and safety precautions. You can make a meal with dishes from one region or mix it up for a truly international feast. Plus, Chef Emeril includes "Did You Know . . ." tidbits of cultural information behind some of the recipes. "Hey, who's going to make (American cuisine) *evolve* if we're not doing that?" he recently said. Couldn't have said it better myself, Chef Emeril. BAM! Okay, his appearance on the Awful Plastic Surgery website may not have been the best thing to happen to his career (or anyone's for that matter). 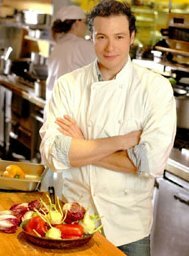 But after his failed stint as the host of WOR Radio's Food Talk as well as his short-lived reality TV career and subsequent disputes with NBC's The Restaurant financier Jeffrey Chodorow, he's now being bashed for his appearance and/or endorsement for the Bertolli company, i.e., the gathering of 100 or so "chefs" staging a mock protest against Bertolli brand pasta products, supposedly designed to keep people from eating out. Come on, folks. As a fellow New Yorker, I say cut this Queens, N.Y. native and one time wunderkind a break here. 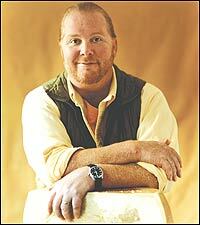 He was once lauded as one of the most talented young chefs in New York, or, so you once said. Well, then...career setbacks -- or no -- that kind of basic "talent" doesn't just evaporate into the air once you're no longer considered to be the culinary world's "flavor of the month." In any event, you can read more about it here in this month's New York Magazine . Jeez, lighten up, guys. Or, at least just a little. In September 2004, Hurricane Ivan ravaged the small Caribbean island of Grenada, completely dismantling homes in its wake -- and changing lives forever. Academy-Award winning actor and longtime island-lover, Morgan Freeman, particularly fond of the peace, beauty, and idyllic serenity Grenada has always had to offer, was devastated when a friend on the island called to tell him about Ivan's destruction. Firmly dedicated to offering his help, Freeman established the Grenada Relief Fund in 2005. 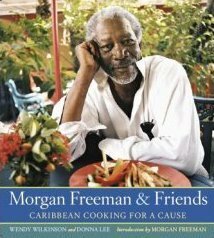 And now comes a totally gorgeous cookbook titled Morgan Freeman & Friends Caribbean Cooking For A Cause also featuring a host of celebrities lending their support to the needs of this lovely island paradise. And, I don’t mind saying that I've already scoped out a Mahi-Mahi and Shrimp and Lime dish that I'll be trying in the very near future. (Even if it's in my very own sort of "non-island paradise" kitchen at home.) Use your imagination, improvise, play some funky steel band rhythms on the stereo...well, you get the picture. And please, don't even get me started on that luscious-looking Coconut Cheesecake! Baby Watson's, New York Cheesecake, Junior's Famous, et al, eat your hearts out, buy this book, read, watch -- and learn. Combine all ingredients in a cocktail shaker and shake. 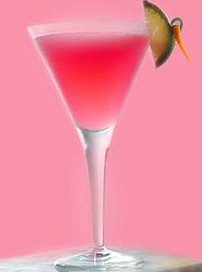 Strain and serve in chilled martini glasses Garnish with a twist of lime. Interesting game (as well as a nail-biting one for all of you who tuned in to watch it! ), but the food spread around the old "homestead" made everything even that much more enjoyable.